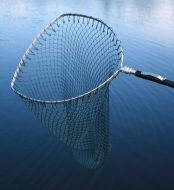 Each landing net is manufactured in our UK factory and made from quality components, high tensile alloy and comes with a rubber sleeved handle and grip. The foldover mechanism is first class, consistently winning best in tests and enables the angler to position the net either on their back or belt by way of a belt clip. 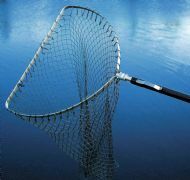 The net can then easilty be removed and, with a gentle flick, lock the net frame into position. Each telescopic extension is manufactured with a piston containing a rubber "O" ring, thus ensuring a smooth transition from closed to fully extended.